This month, we were able to assess the impact of several of our programs that have been running over the past year. The results are promising – helmet use is up 35% among boda boda drivers in Kampala, Uganda, and helmet use in our program schools in Vietnam has increased by percentages ranging from 21% to 95%. Thank you for supporting us and saving more and more vulnerable road users every year. At Rio+20, the United Nations Conference on Sustainable Development (20-22 June 2012), AIP Foundation joined an international coalition of road safety stakeholders making a Voluntary Commitment to protecting children from traffic injuries and improving their urban environment. Under the banner of the Zenani Mandela campaign, the organizations aim to promote policies that protect children and young people and improve their environment, particularly highlighting affordable infrastructure, enforcement and awareness raising solutions to make the school journey safe. "With the 2nd UN Global Road Safety Week in May 2013 as a worldwide platform we will promote safe walking and cycling as a right for all, and highlight the co-benefits for climate change, air quality and anti-obesity policies, in addition to injury prevention, of such an approach. To demonstrate practical delivery, we will implement pilot projects to showcase sustainable urban road design, improved cycling and pedestrian provision, safe routes to school, community empowerment and measurable child injury prevention." The action plan is supported by Amend, AIP Foundation, Costa Rica Automobile Club, Dutch Cycling Embassy, EMBARQ, the FIA Foundation, the International Road Assessment Programme, Make Roads Safe, the Road Safety Fund, Safe Kids Worldwide, the Share the Road initiative, and the UN Environment Programme. Deputy PM wants to reduce road toll - Prime Minister Nguyen Xuan Phuc yesterday called on all provinces and relevant agencies to find ways to reduce the number of traffic accidents nationwide. Phuc recognized the models being implemented in many cities that had helped lower the number of traffic accidents and congestion, such as Ha Noi's efforts to catch criminal activities on buses, Da Nang's campaign to promote safe helmets, and An Giang Province's efforts to encourage office workers to say no to alcohol during lunchtimes. International helmet expert and road safety specialist Dr. Terry Smith visited Hanoi, Danang and Ho Chi Minh City from June 10 to 17 to monitor and advise Vietnamese helmet testing laboratories. Dr. Smith also consulted with the National Traffic Safety Committee (NTSC) on ways and means to eliminate poor quality and fake helmets from the Vietnamese market. In 2000, Dr. Smith and AIP Foundation assisted the government with the development of the new national helmet standard (TVCN 5756) which formed the foundation for the development of Resolution 32, Vietnam's mandatory helmet law. Dr. Smith is a member of AIP Foundation's Advisory Board and helped establish the helmet testing laboratory at the Protec Helmet Factory. Every day, the Protec helmet testing lab performs quality assurance testing on Protec helmet products to ensure that they continue to meet QCVN2 (the Vietnamese motorcycle helmet standard) and adequately protect motorcycle helmet users in the event of a crash. 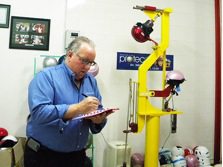 During his visit to the Protec Helmet Testing Laboratory, Dr. Smith reviewed the status of all helmet test instrumentation and equipment and performed impact testing as part of an Inter-Laboratory Comparison (ILC) project between Vietnamese laboratories and other ISO 17025 accredited helmet testing laboratories located in the USA, China and Japan. He then performed similar ILC tests at the three other government owned helmet testing laboratories. When fifth grader Nguyễn Ngọc Mai Thảo was being driven home from school on her older brother's motorcycle, they crashed into a fence and fell off. Thao, unconscious, was hospitalized. The doctor diagnosed a brain hematoma along with Thao's many scratches, but she is now recovering well. Her brother's chin was torn and required stitches. 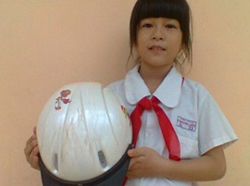 The doctor told Thao's mother that the helmet saved the young girl's life. June marks the end of the 2011-2012 school year in Vietnam. 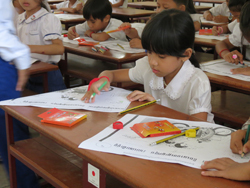 As children break for the summer, a review of AIP Foundation’s school-based and public awareness programs shows that the Vietnam team achieved outstanding results. Click here to read the full report of outcomes and impact. Helmets for Kids interventions have seen a considerable increase in helmet use (ranging between 21% and 95% increases) across all program schools. As of May 30, nine crashes were reported where the donated helmets have saved lives of the students. Two schools received Safe Routes to Schools' interventions this year, involving a total of 2,318 students. As a result, Grade 4 and Grade 3 students' knowledge test results increased by 23.2% and 19% respectively. Furthermore, 32 primary schools with a total of 22,000 students have benefitted from Safe Kids Walk This Way interventions. As a result, the percentage of students who reported feeling safe near school increased from 61.27% in the pre-project assessment to 75.51%. The Traffic Safety Park and a Traffic Safety Camp resulted in an improvement in road safety test results, and focus groups revealed positive outcomes. The "Click on Safety" e-learning program was run in three schools for a total of 1,166 Grade 1 students. Results show that e-learning students scored higher than those taught with the traditional methods. Pedestrian research in Dong Nai shows deterioration in the traffic safety situation there. Specifically, data shows that the number of children seeking emergency treatment for road traffic injuries increased sharply in all age groups. The number increased by 71.4% among 0-4 year olds, by 155.9% among 5-14 year olds, and by 63.6% among 15-19 year olds. Moreover, child pedestrians under the age of 15 accounted for a quarter of road crash victims who receive emergency aid at Dong Nai Pediatric Hospital. The public awareness campaign's TV commercial is being aired extensively on national and local channels in Vietnam's 63 provinces. A number of events were organized, including Family Day with 1,000 people, a high level workshop held in collaboration with UNICEF and Ministry of Transport, a road parade in HCMC's District 9, and more. Since November 2011, there have been 55 articles in the press, 182 online articles, and 30 instances of television coverage about the campaign. Hun Sen Urges Action to Curb Bus Crashes - A recent surge of bus crashes injuring local and foreign tourists led the Prime Minister to formally urge bus companies to respect traffic laws. The Director of the Land Transport Department in the Ministry of Transport and Public Works stated that road accidents in 2012 had caused 908 deaths by May. 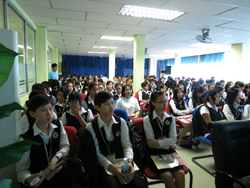 AIP Foundation collaborated with Dai Thom II Driving School to organize two trainings on safe travel behaviors for over 400 Singapore International School (SIS) students and 300 students at National University of Management. The schools' boards of management were motivated to provide a helmet use education course for their students due to the fact that several of their students suffer injuries and deaths due to road traffic crashes each year. 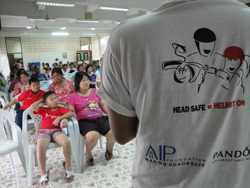 AIP Foundation equipped the students with road safety knowledge, particularly concerning correct helmet use and the importance of wearing helmets even as passenger. 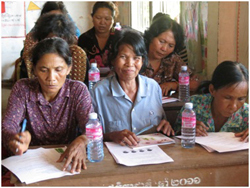 Around 49 parents participated in a training on correct helmet use at Phnom Dil Primary School. The attendees also included school committee members and commune committee members. The training focused on parents' crucial roles in ensuring that their children wear a helmet every day, in the hopes that this would significantly improve the helmet use rates among students in this school and in their broader community. The training ended in a discussion where parents talked about their responsibilities and ways of keeping their children safe on a daily basis. In its efforts to maximize the impact of its Helmets for Kids program, Hun Sen Check Angre Primary School designed and implemented extracurricular activities for over 1,900 students. The activities took place from March to June 2012. Through games and quizzes, children were reminded of their lessons in correct helmet use, safe street crossing skills, and riding a bicycle safely. Out in the school yard, teachers and AIP Foundation staff assisted them in practicing these safe road behaviors, played a fun game of ping-pong with them, and facilitated a Q&A session. In an innovative new approach to road safety education, traffic police officers were brought directly into a school to teach 600 primary students about helmet use and safe road behaviors. After a classroom session, the police officers took the students to the school yard to practice the safe behaviors they had just learned on a simulated road. 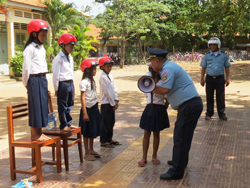 After the training was completed, the police officers quizzed the students about helmet use, crossing the road, and riding a bicycle safely, handing out prizes to over 20 students who responded correctly. At the end of the day, the traffic police assisted the students crossing the busy road on their way home. This month, AIP Foundation's Cambodia team continued to conduct community outreach in order to promote passenger helmet use throughout Phnom Penh. This campaign component has been ongoing since February 2012 and had led to hundreds of passengers without helmets being stopped along the road and provided with information about the importance of helmet use, the road crash situation in Cambodia, and the upcoming legislation amendment which will require passengers to wear helmets. In June, the intervention focused mostly on students and their passengers, with AIP Foundation staff posted around school gates. Crusade for Wearing Safety Helmets - Laem Chabang Municipality launched a road safety campaign called Safety First with Crash Helmets. The project is being organized by the Thai Bike Club and Esso Company Limited, and is aimed at urging people who ride motorcycles to always wear a safety helmet while on the roads. AIP Foundation is proud to announce a new Thai-language website, focused primarily on our organization’s work in Thailand. Access the website to read our news, view pictures of the events, watch our public service announcements, and download press releases. AIP Foundation Thailand presented at a Parent-Teacher Meeting at Wat Nakprok School in the context of the Helmets for Kids program being sponsored at this school by Sigma Elevators next month, in July 2012. 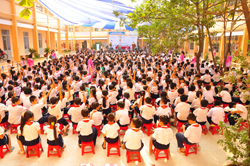 Diversey Hygiene's sponsorship of a Helmets for Kids program at Wat Suwan Primary School came to a close with a final activity for the children. Mrs. Metta Angtrakoon, HRD Consultant of The Institute for the Promotion of Teaching Science and Technology (IPST) was a speaker for Road Safety Training Program and managed the outdoor activities for students. Foreign exchange students from Chulalongkorn Universities volunteered to help run the event. Boda Boda Warned on Breaking Traffic Rules - Kampala Metropolitan police commander Andrew Kawesi suspended a police crackdown on boda-boda operators in the city after the riders staged protests against what they called police harassment and extortion. The Uganda Helmet Vaccine Initiative has been conducting workshops for boda boda (motorcycle taxi) drivers in Uganda, as part of an awareness campaign including radio spots and helmet donations. The results from the first five workshops have been obtained, and reveal an average helmet wearing rate increase of 35%. To assess the campaign's effectiveness, helmet use observations have been conducted before the workshops, three days after the workshops, and again 2 months later. Final results will be available in September 2012.